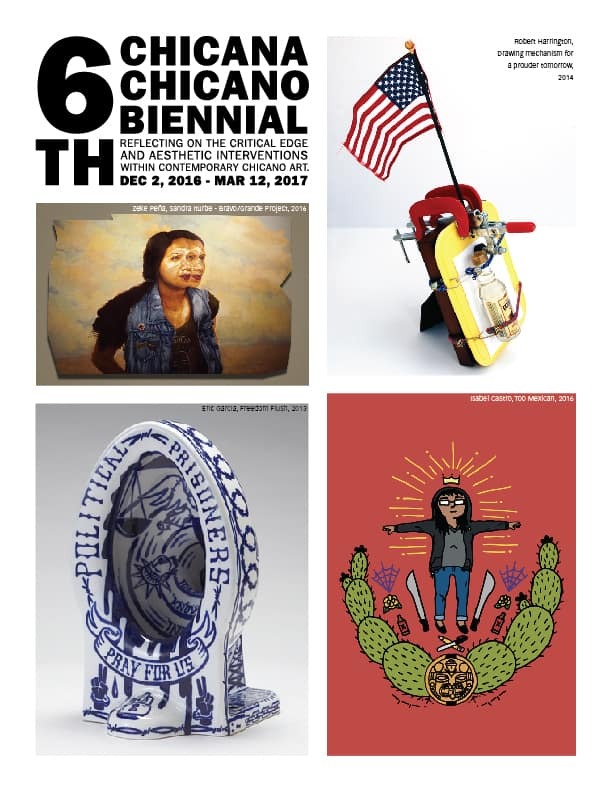 November 20, 2016 (San José, CA)—MACLA/ Movimiento de Arte y Cultura Latino Americana presents its much-anticipated 6th Chicana/o Biennial, opening December 2, 2016 and will run through March 12, 2017. MACLA/ Movimiento de Arte y Cultura Latino Americana is pleased to present its much-anticipated 6th Chicana/o Biennial, MACLA’s most visible and popular juried exhibition that “takes inventory of the critical edge and aesthetic interventions within contemporary Chicano art.” Curated by Guest Jurors Melanie Cervantes, artist and activist (Dignidad Rebelde), Eugene Rodriguez, artist and lecturer, and Joey Reyes, Curator of Engagement & Dialogue at MACLA. In its 25 years MACLA has showcased the work of emerging and established Latino artists in the Bay Area,United States and beyond. The Chicana/o Biennial is MACLA’s most visible and popular juried exhibition and the only Biennial exclusively dedicated to Contemporary Chicana/o Art in the U.S.
As with previous biennials, MACLA’s 6th Biennial presents artists of different generations and backgrounds working in a wide variety of media including video, sculpture, painting, printmaking, and photography. The exhibiting artists represent a cross-generation from the rich cultural and artistic worlds of California, Texas, Florida, Illinois, and Pennsylvania. The artists in the sixth edition of the Chicana/o Biennial hold up a mirror to the changing realities of contemporary American politics tackling issues of urgency today: immigration, border politics, labor, class, inequality, race, identity, nationality, spirituality, health, and the environment.